SEATTLE – For much of the season, Washington star cornerback Sidney Jones has lived a lonely existence. A man on an island, he’s been. Until Saturday’s game at California, the story of Jones’ season was largely about what he hadn’t done. That is, he hadn’t done much, and that’s because opposing quarterbacks had mostly been avoiding him. Through the first eight games of the season, quarterbacks had thrown toward Jones just 17 times, according to an analysis by Pro Football Focus. That changed last Saturday when Jones, matched up often against Cal’s standout receiver, Chad Hansen, was targeted 13 times in the Huskies’ 66-27 victory in Berkeley – resulting in just four catches for 51 yards. Jones intercepted Cal’s Davis Webb twice in the third quarter – giving him a team-high three on the season – and was credited with two additional pass break-ups. On Monday, he was named Pac-12’s defensive player of the week. Cal did score one touchdown against Jones on Saturday, but UW co-defensive coordinator Jimmy Lake on Tuesday took the blame for the coverage mix-up on that particular play. Jones did give up a 38-yard reception to Hansen on one “go” route, and Lake said he expects other quarterbacks to continue to challenge Jones. A year ago, Jones had perhaps the finest game of his career in Washington’s upset of Southern California in Los Angeles – and did so while playing with a strained hamstring. In the first quarter, he dissected a screen pass and intercepted Cody Kessler. In the third quarter, he knocked the ball away from the Trojans’ JuJu Smith-Schuster, a forced fumble that set up the Huskies’ go-ahead score. 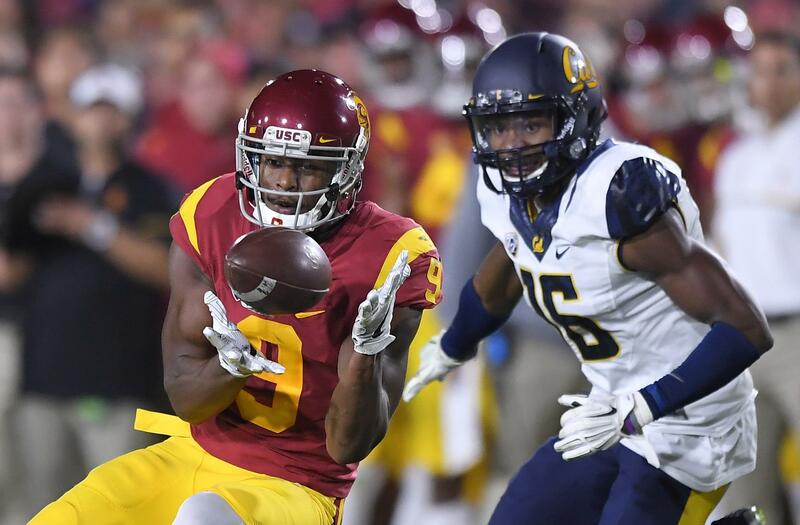 Jones and Smith-Schuster, both projected as high NFL draft picks, are expected to square off again when the Trojans (6-3, 5-2 Pac-12) visit the No. 4 Huskies (9-0, 6-0) Saturday at Husky Stadium. More than a dozen pro scouts are expected to attend, and no doubt they’ll be watching that matchup closely. Published: Nov. 9, 2016, 6:50 p.m.